Marcus Law was pleased to see Kettering Town make further progress in the CSS League Challenge Cup on Tuesday night. The Poppies drew 1-1 with Barwell at Latimer Park with Dan Holman’s opener being cancelled out by a Brady Hickey penalty for the visitors in the first half. But it was Kettering who held their nerve in the resulting shoot-out as Brett Solkhon, Rhys Hoenes, Lathaniel Rowe-Turner and Holman all scored their spot-kicks to secure a 4-2 success as former Poppy Liam Canavan and Elliott Putman missed for Barwell. The win means Kettering are now into the last eight of the competition and Law was left content with a productive evening. “We gave people minutes and looked at a few things,” he said. “We set out a way of playing and we got the lead but it was disappointing to concede another penalty. “We don’t seem to be getting any decisions all of a sudden while certain decisions are going against us. “But we got in at half-time, we changed the shape and we changed personnel, which suited us as much as the game and we were better in the second half. 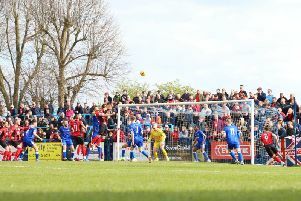 The game was played in front of a crowd of just 111 - the Poppies’ lowest-ever attendance for a first-team fixture, excluding NFA Hillier Senior Cup matches. Law, meanwhile, confirmed the club have appealed the red card shown to striker Holman during the first half of last weekend’s 3-0 home defeat to St Ives Town. A decision on the appeal is expected on Friday but if it is not successful, Holman’s three-match ban will begin this weekend when Kettering host Lowestoft Town in the Evo-Stik League South Premier Division Central. It has now been confirmed that the Poppies’ Boxing Day trip to Bedworth United will be a 1pm kick-off while Kettering’s home game against Coalville Town has been re-arranged for Tuesday, January 22 (7.45pm).